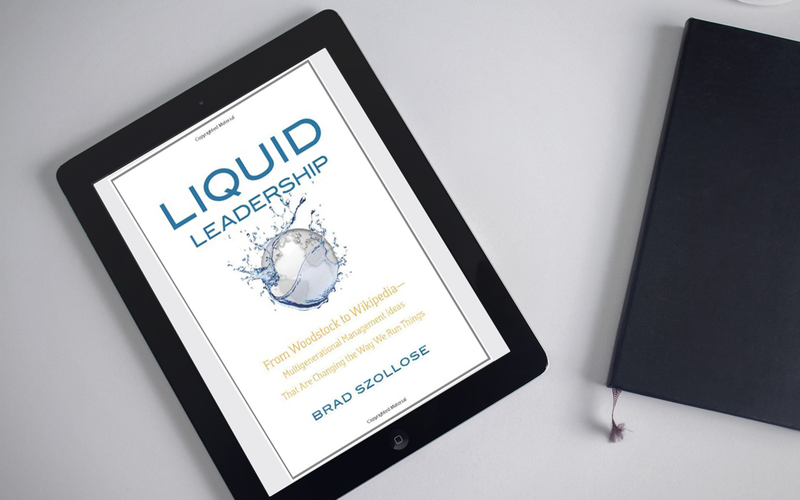 Liquid Leadership: From Woodstock to Wikipedia by Brad Szollose. It can be extremely intimidating to write a book and many mere mortals quit before even getting started. In Brad’s book, Liquid Leadership, you, the reader, will quickly discover that his knowledge, wisdom, and insights picked up throughout his own life journey are not only worth noting, but, more importantly, reading and using to improve your own life, career, or business. His brutal honesty is refreshing and inspiring in an age of finger pointing and victim mentality that courses through many declining industries that refuse to change and grow. You will quickly realize that what Brad has dubbed “liquid leadership” is why smart firms and organizations are able to compete and thrive in todays changed and ultraconservative economy. They place high value on people’s ideas and talents. This book serves as both a powerful wakeup call if you apply its lessons and as a reminder to treat every person you work with, serve, and do business with as a valued human being capable of great ideas. This is especially important for Gen Y as they enter and attempt to advance their ideas in a battered and fragile economic landscape. I have some great news for you: this is not another boring business book that wastes your valuable time. Brad’s wit and ability to engage via powerful stories that jump off the pages will capture your mind and imagination. His insights are powerful and directly applicable from someone who’s led a successful firm that went public during the go-go 1990’s. Not many people have this on their resume as it takes incredible hustle, persistence, and a unique skill set, which Brad shares up close and from the front line of business battle. As you peruse this book, with highlighter in hand, you’ll discover powerful lessons from not only Brad’s company, but from other firms as well, such as Starbucks, Harley Davidson, and GM to name a few, and why they’re important to learn from. Business was a lot easier a few years ago when credit was cheap, consumers were forgiving, and the phone and email had willing and tolerant buyers ready to spend money. Stop the presses. My, how quickly things have changed! Many of today’s so-called leaders are now scratching their heads and wondering why the old leadership playbook isn’t working. In many instances their team isn’t listening and it’s as plain as day to see they’re often just going through the motions until the five o’clock whistle arrives so they can quickly scurry out the office like newly released suspects on bail. They want to get as far away from the office as possible to get a leg up on traffic so they can jump online to see how their moonlight gig or exciting part-time business venture is doing. About the author: Brad Szollose is a global business adviser and the foremost expert on Cross Generational Issues and Workforce Culture Strategies. His best-selling book, Liquid Leadership: From Woodstock to Wikipedia, shares Brad’s journey beginning as a business idea in a coffee shop to C-level executive of a publicly traded company worth 26 Million dollars in just 24 short months! Brad’s programs have transformed a new generation of business leaders, helping them maximize their corporate culture, expectations, productivity, and sales growth in The Information Age. For more information visit: www.LiquidLeadership.com.